Donations/Gifts: These gifts subsidize the school’s operating expenses such as teacher salaries, books, supplies, etc. These help make up the difference between what tuition covers and the actual cost of running the school. Participation in School Fundraisers: From participation in school Rosh Chodesh Hot Lunches to buying Purim Baskets, all this support ultimately goes back to the school to directly benefit the students. Participation via parent volunteer hours is equally valuable. Parent involvement in school events is critical to their success and a good way to show support. There are many ways to volunteer. Tribute Cards: Hebrew Academy can send a special tribute card to your designees. Use them for acknowledging a Simcha (such as a birth, birthday, anniversary or engagement), or wishing a Refuah Shelaima (complete recovery of health) or condolences. 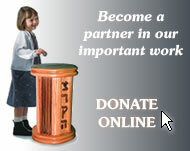 What a great way to honor someone than to give Tzedakah in their name!